Welcome to the official blog of the community/outreach team for the WordPress open source project! This team oversees official events, mentorship programs, diversity initiatives, contributor outreach, and other ways of growing our community. If you love WordPress and want to help us do these things, join in! We use this blog for policy debates, project announcements, and status reports. Everyone is welcome and encouraged to comment on posts and join the discussion. You can learn about our current activities on the Team Projects page. These projects are suitable for everyone from newcomers to WordPress community elders. You can use our contact form to volunteer for one of our projects. We have Office Hours four times a week in the #community-events channel on Slack: Mondays & Wednesdays 22:00 UTC, Tuesdays and Thursdays 9:00 UTC. We also have regular Community Team meetings on the first and third Thursdays of every month at 11:00 UTC and 20:00 UTC in #community-team on Slack (same agenda). If you have questions about the Events and News dashboard widget that came out in WordPress 4.8, please read this FAQ! TL;DR: There’s now a plugin to show upcoming local events in your wp-admin. Test it out and give us feedback! 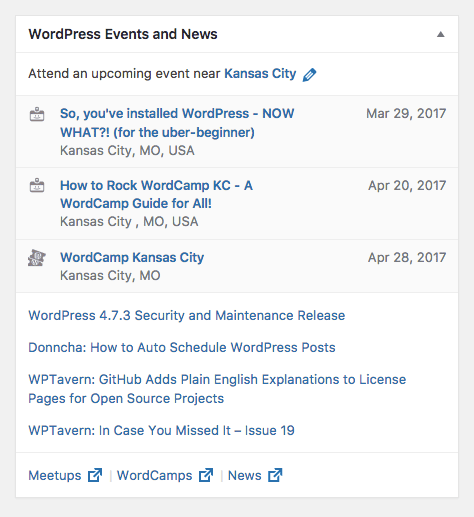 Every few years, someone suggests that it’d be helpful to show upcoming WordCamps and meetup events inside wp-admin, rather than expecting users to find out about those events on their own. Whenever it comes up, almost everyone thinks it’s a great idea, but for one reason or another we’ve just never gotten around to actually doing it. A few months ago, though, a group of us decided to give it a shot, and we’ve come up with a rough draft. 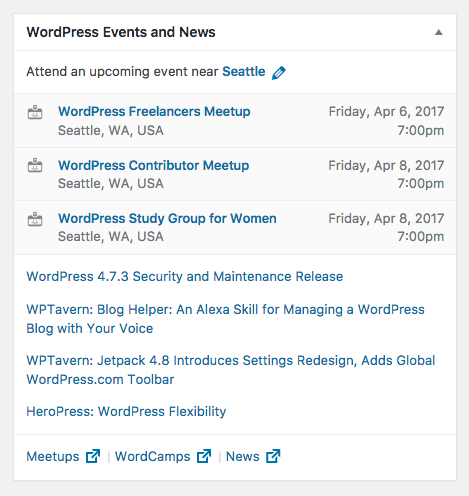 It’s called Nearby WordPress Events, and it’s available in the WordPress.org plugin directory today. The plugin updates the existing WordPress News dashboard widget to also include upcoming meetup events and WordCamps near the current user’s location. 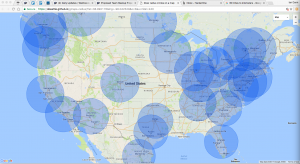 If you have multiple users on your site, each one will be shown the events that are close to their individual location. The dashboard widget will try to automatically detect their location, but they’ll also be able to enter any city they like. The WordCamp and meetup event data for the plugin is provided by a new api.wordpress.org endpoint [source, documentation]. 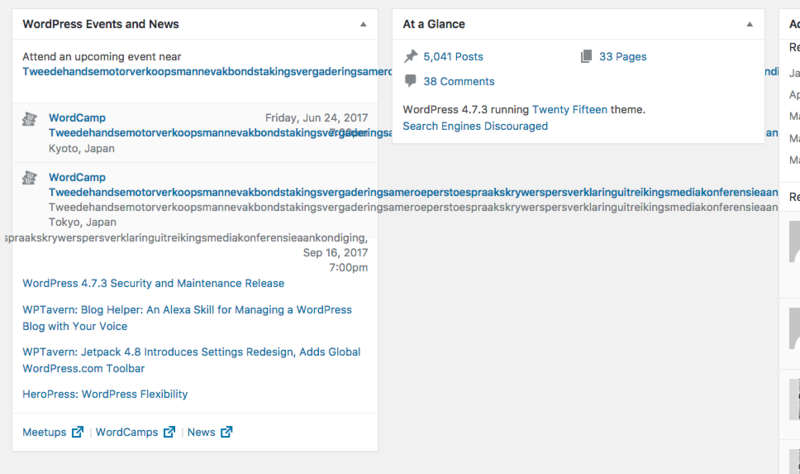 The community that has been created around WordPress is one of its best features, and one of the primary reasons for its success, but many users are still unaware that it exists, and aren’t taking advantage of all of the resources that it makes available to them. 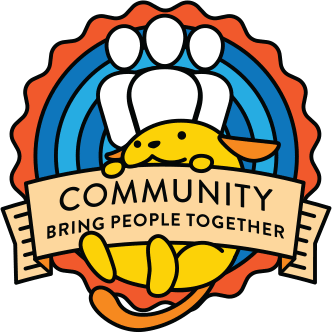 Inviting more people to join the community will help to increase its overall health, diversity, and effectiveness, which in turn helps to ensure that WordPress will continue to thrive in the years to come. We think that wp-admin is the perfect place to display these events, because that’s the place where almost all WordPress users are visiting already. Instead of expecting them to come to us, we can bring the relevant information directly to them. The plugin and API endpoint are just rough drafts right now, and haven’t seen any real-world usage yet. We’d love to get your feedback on them, and iterate based on that. We’d especially love to see how well they work for locations outside the United States, languages other than English, and anyone using assistive devices. So, what do you think? How well did it work for you? Do you have any suggestions, bug reports, or feature requests? Where can I talk about API? Right now we only have code to pull events from WordCamp.org and meetup.com, but we can definitely add support for additional APIs. Off the top of my head, I think the only real barrier is that we might need to map DoorKeeper groups to meetup.com groups, since right now meetup.com is the canonical list of official groups. That shouldn’t be too hard, though. 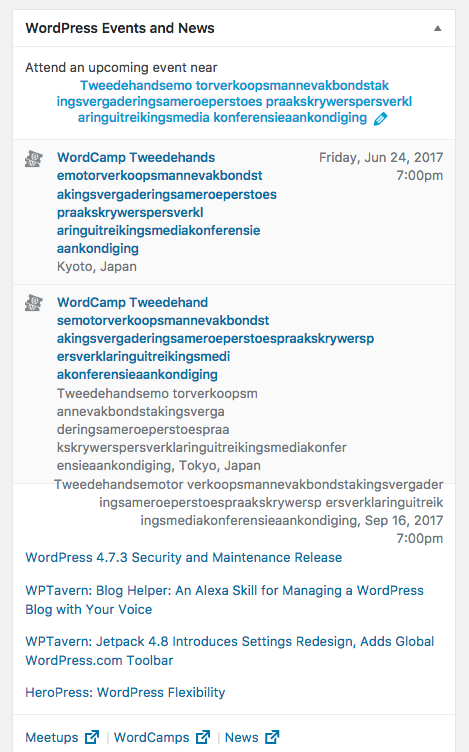 I’d suggest creating a Meta ticket for that in the `WordCamp` component, and tag it with `good-first-bug` and `needs-patch`. It’d be good to also mention in the new ticket that #1292 is a related ticket. The plugin that’s used to pull the data from those APIs is called Official WordPress Events, and it’s open-source in the Meta repo. In the meantime, a workaround is to cross-post your events to your meetup.com group (assuming it’s an official group on the chapter account). Where do we submit bug reports? 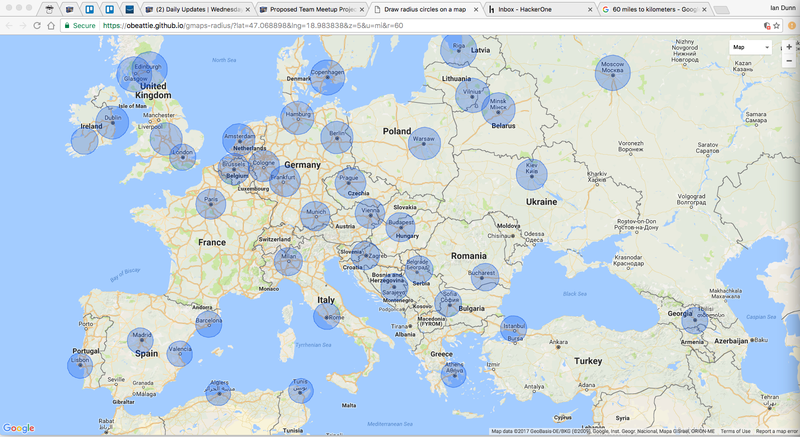 • Time Zone offsets are required, (I think), I just installed the plugin on my site and it is showing a Meetup that I organised and attended ~26hrs 19mins ago… I’d expect this meetup to not be shown. I’m taking a wild guess here that as I’m in UTC+10 the Meetup API requests are only returned as UTC? If it’s something in the widget itself, then the w.org support forums, or the GitHub repo are the best places. If it’s with the API, then Meta Trac is the best place. Reporting things here works too, regardless of if it’s in the widget or the API. I’m already tracking the timezone bug, so you don’t no need to create a ticket for that one. Very Nice! Could this slated as a featured plugin to be wrapped into core in the future? That’s my hope! It’s still rough around the edges, though, so I’m hoping to get some feedback from everybody first, and make sure it’s in great shape before we propose it. I like this idea to find new members for the community. A nice handy solution for a plugin, however not for the core. The core should only add features for the most of the users, the target group. I think this is too much information for a lot of users. It is also a request, also settings data that not helps a lot of installations in the wild. I’ll reply to each part in separate comments, to help keep the discussion manageable. To me personally, it seems like this would pass the 80% guideline, since I think the majority of users would be interested in at least knowing that local events are available to them, and the majority would benefit from the resources that the community provides. It seems like information about events is just as relevant than the news items that are currently in Core, if not more so. That’s just my personal opinion, though. I’m definitely interested to hear what you and everyone else think. Can you tell me more about that? Does the current design make the widget feel cluttered or overwhelming? I wonder if there are some tweaks we could make to help with that, even if it never goes into Core. Or is it another problem entirely? What are your specific concerns about the HTTP request? The initial request is done asynchronously, so it won’t slow down the page loading time. The response is cached for 12 hours, to avoid making unnecessary requests. What are your specific concerns about the database settings? 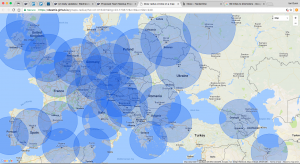 The first record is nearbywp-location inside wp_usermeta, which stores each user’s location. That takes up about 150 bytes. There’s one record for every user with a role on each site in the network (assuming they’ve visited the Dashboard). So, that could potentially be a lot of records in larger networks, but wp_usermeta already has at least 12 records per user, so it doesn’t seem like it’d be a significant increase. If a site already has the infrastructure to support 1,000,000+ users, then I don’t think this would affect them in any noticeable way. The second record is a transient to store the cached event data. That takes up about 1.5 kilobytes. The transient is shared across users, so if you have 500 users, but they’re all in Seattle, then there will only be 1 transient to cache the events for all of them. If you have 500 users, but they’re all in different locations, then there would be 500 transients. That still doesn’t seem like a significant increase to me, though, for the same reasons as above. Do you feel like the size or number of records would be a problem? Or do you have other concerns? One thing I noticed when testing the plugin with different languages is that it doesn’t support user language yet. When my site language is default en_US, and I switch my user language to de_DE, the core dashboard widget would localize the news feed. This plugin does not do that (yet), it always shows news from the English feed. Another thing I noticed (related to what @mayukojpn said above) is that some URLs can’t be localized (yet). It’d be preferable for locale teams to be able to localize the Meetups and News links in the footer of the widget. Thanks, that’s not the news feed though, is it? I was wondering about the news items being displayed underneath the events list. When my site language is default en_US, and I switch my user language to de_DE [the plugin] always shows news from the English feed. I’ll look into both of those issues and see if I can figure them out. some URLs can’t be localized (yet). It’d be preferable for locale teams to be able to localize the Meetups and News links in the footer of the widget. @mayukojpn fixed the News links, but I’m not sure that the Meetups one should change based on locale. I think the intent for that link was that it would take the user to a list of all meetups in the world. If that is correct, then I think we’d want all users to see the same content. It should be localized, of course, but we’d want to link to something like `meetup.com/pro/wordpress` for English speakers, and `meetup.de/pro/wordpress` for German speakers. Does that seem right to you too? As far as I can tell, though, unfortunately meetup.com doesn’t provide locale-specific pages. Is that correct? 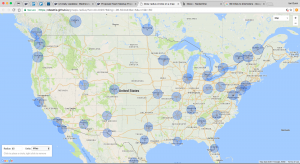 Yea, the meetups link isn’t intended to change based on locale. We tried to take that into account, by including a bigger radius than what we thought the average person would be willing to travel. For meetups, the API includes any events within a 100 kilometer radius (roughly an hour of driving time each way); for WordCamps, it’s a 350 kilometer radius (roughly 3.5 hours driving time each way). Does anybody see any problems there? We can always increase the distance. I am a big fan of this feature and belatedly am commenting. First-off, +1 for the concept. The initial stuff looks great, Ian. 1. I’m out in Seattle where we have a WordCamp scheduled for November and a lot of meetups happen between now and then. I suspect that WordCamp wouldn’t make it into the visible list until a week or two before it’s happening. It feels like they should somehow be “sticky” in the list so people know they’re coming up with enough advance warning. 1b. Even the meetup list could get too crowded in Seattle to let people plan. Maybe there could be some type of “And X more events coming up in the next 30 days” link if there is an overflow events. 2. One thing I’ve learned about meetups is that time of day makes a huge difference for who is interested in attending. That’s a determining factor for many attendees. Therefore, displaying the start time feels like a worthwhile piece of information to reduce the number of clicks through to meetup.com that don’t result in an RSVP. 4. Long-term, it would be amazing to let users connect to their Meetup.com account and RSVP straight from the Dashboard. That feels like a distinctly v2 feature, though. Again, great work! I hope to see this in my Dashboard soon! 1. WordCamp wouldn’t make it into the visible list until a week or two before it’s happening. It feels like they should somehow be “sticky” in the list so people know they’re coming up with enough advance warning. I think that’s a great point. My first thought was to stick it to the top, like the News section does with posts to w.org/news. But, now I’m wondering if we should stick it to the bottom instead. If it were at the top, I think users might get used to seeing it there all the time, and it’d make it feel like the content there wasn’t changing, so they wouldn’t really “see” the meetups anymore, they’d just ignore the whole section. Once the WordCamp date gets close, I think the entry should stop sticking and just flow into the normal chronological order. There could be multiple camps in the geographic range, though. Do we include the one that’s happening the soonest? The one that’s closest geographically? If we do the former, then their hometown camp might not be shown until the week of the event. If we do the latter, though, they might miss out on additional camps they want to go to. If we do all, then that might clutter the widget. I’d lean towards geographic, but maybe there’s a better option. @mapk (and everyone else), do you have any thoughts? 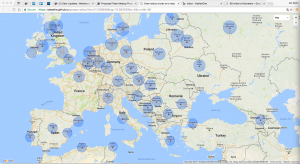 What about a filter to only view WordCamps or Meetups? It seems like that would mean the user would have to know the difference between them, and make an extra effort to interact with the widget. Since the most important persona for the widget is someone who doesn’t already know about the community, I suspect that most wouldn’t take advantage of a filter like that. If we can just show it to them automatically, though, I suspect that’d be more effective at piquing their interest. That’s just a guess, though. Hmmm, good question, I’m not really sure. My gut instinct is that it would feel odd to me, like it wouldn’t feel logical to have it out of chronological order. Does that resonate with anyone else, or would it feel different? +1 for sticky on the bottom. I think closest geographically works, especially if adding counts to the WordCamp link as proposed below. That’s a great point too. @mapk, do you have any thoughts on that? I’m hesitant about adding more. Isn’t this why we have the “Meetups” link that takes the user to all the meetups? I know it shows all meetups, but if the browser is aware of the location, then meetup.com uses that to show local events. That’s a good point. Maybe we could make the link says Meetups (7) (to represent 7 events coming up in the next month)? I’m not sure if that’d be intuitive, though. I’m not sure if having the counts would make as much sense for WordCamps and News, though. Just brainstorming. I’m a fan of counts personally. I agree it doesn’t make sense for News, but I do think it makes sense for WordCamps. IIRC, that was left out to avoid cluttering it, but I agree that it’s worth reconsidering. What do you think, @camikaos, @chanthaboune, @mapk? We can add the time below the date. It does add a bit of clutter, but not as much as I was worried about. Does that look ok to everyone? In this same vein, I wonder if adding the day of the week would be helpful, since that could also be a determining factor. A event at noon could be very different on a weekday than on a weekend. Or maybe that’s just going too far down the rabbit hole, and it’s simpler to just ask users to open the link if the topic sounds interesting? I dunno. I think I’m leaning towards showing the time and day of the week, but don’t feel too strongly. That’s a great point about day of the week. I agree that it’s a bit more cluttered but this feels worth it. Getting a bit of i18n feedback might be good here as I have no idea how long weekdays can get in languages other than English. One way to deal with length (maybe) would be to flip the date/time and location. I think I might even like that more. Not always a fan of this solution, but text-overflow: ellipsis; might be called for in this case. I think a time and date would be incredibly valuable. 3. I wonder if the inclusion of an auto-detected location will make people think WordPress is “phoning home.” […] I wonder if there should be a notice somewhere to let users know that information is not stored. I’m not sure what a good way would be to communicate that to users if it gets merged into Core, though. Timezone/locale don’t seem very sensitive or personally-identifiable, but seeing the IP of the user is new. Previously api.wordpress.org requests would only see the IP of the server that Core is installed on. w.org sees users IP’s when they browse the website, of course, though. This feels like a one-time popup/pointer/dismissable message use case that’s shown on first install. Hmmm, I guess my concern about that is that, I’d assume that only about 5% of people would actually care about it, so using an intrusive notice might desensitize the other 95% to notices in general, since they’d consider them overused. At least personally, I’m very quick to dismiss any kind of notification from an app, because 99% of the time it’s something that the app makers care about, but I don’t at all. @georgestephanis had a really clever idea about partially anonymizing the IP by fuzzying the last octet, so it’s just a network ID. That was done in time to make it into 4.8. So, worst case scenario, the only thing w.org knows is which ISP the user is connected to, not their individual IP address. The IP is also sent much less often in the latest version; only when there isn’t a saved location. If someone wants to, they could also write a small plugin to filter the HTTP request (using `pre_http_request` as suggested in #39400-core) and strip out the IP address parameter entirely. That seems like an awesome improvement! Does this comply with the new privacy law on Europe? That’s a good question. I’ll admit I’m not up to date on the new law. @johnbillion mentioned it today too, though. Does anyone have enough time and legal expertise to look into it and report back? Also, does anyone feel like writing a plugin for those who want to avoid sending the IP? Definitely v2, but that’s an awesome idea! Wonderfull … i tought about 2010. Now it is real and a best Information for WordPress beginners! We have regular Community Team meetings on the first and third Thursdays of every month. Each chat happens twice in the same day to cater to different time zones. Meeting times are 11:00 UTC and 20:00 UTC in #community-team on Slack.